Darwin gets a lot of credit in biology. And rightly so, given the sheer quantity of persuasive proofs and fascinating conundrums that he put forth during his career. This is a man who saw a foot-long nectary on an orchid from Madagascar and asserted the existence, sight unseen, of a moth with a proboscis long enough to reach the nectar at the bottom and pollinate the flower. Forty years later he was proven correct. So it is no exaggeration to say that Darwin left a legacy of leads for his intellectual inheritors, many of whom are fond of claiming Darwin not only as an ancestor but also as the source of all of the best ideas and problems in evolutionary biology to this day. The Galápagos Islands have long been the scene of such claims. 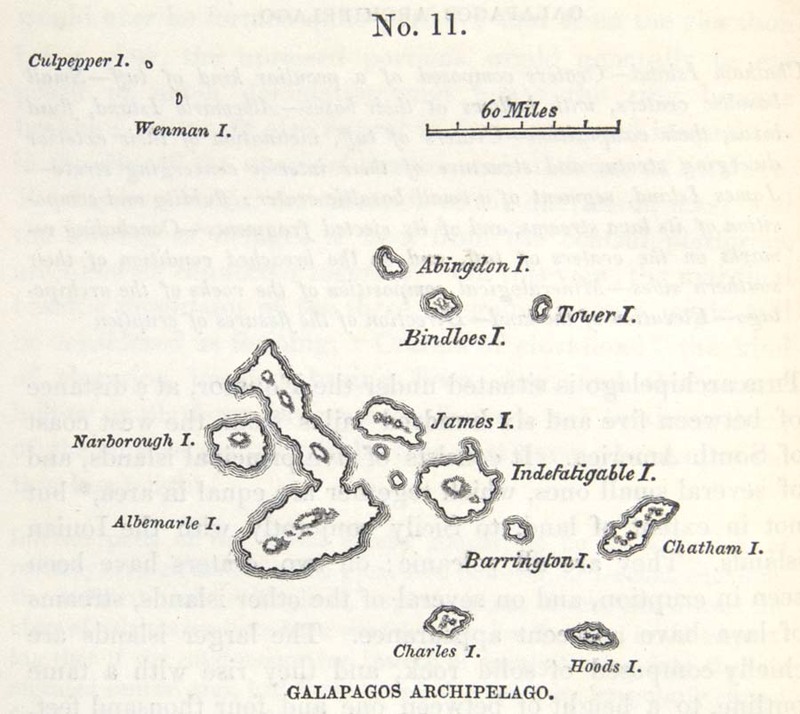 Darwin travelled around the world from 1831 to 1836, but he spent barely over than a month exploring the Galápagos. 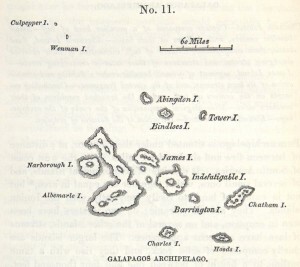 Map of the Galápagos Islands, from Darwin's Journal of Researches, published in 1839. Even so, this volcanic archipelago off the coast of Ecuador became one of the iconic locations of Darwin’s Beagle voyage. Because of the attention that Darwin drew to the evolutionary dynamics of the Galápagos, the islands became a so-called “natural laboratory,” where biologists have gone for generations to watch evolution in action. In this month’s issue of Evolution, researchers led by Fernando de León from McGill University in Montréal chose these iconic islands —and one of their most iconic groups of animals, the birds known as Darwin’s finches— as the arena for tackling an appropriately Darwinian question: How do humans alter the trajectory of other species’ evolution? This question is at the heart of Darwinian theory itself. The very name that Darwin gave to his mechanism for evolutionary change reveals how difficult it is for humans to think about evolutionary change without becoming self-referential. Natural selection is actually a passive process in which nobody is directly or consciously selecting anything. The wing length or leaf shape or antennae placement that is “selected” is merely that which allows the animal or plant to face the challenges presented by its environment and have babies that can do the same. The term “natural selection” reflects the analogy that Darwin made between what happens in nature, the product of mere survival, and what happens when humans interfere with nature and breed specific features into animals and plants through artificial selection. In other words, humans have long been altering the trajectory of other species’ evolution. But animal and plant breeding is only the most obvious and most intentional way that we do this. As animals ourselves, with our own needs and interests, we have also been unintentionally changing the course of evolution since we came into existence. How do we evaluate the evolutionary effects that we have on other organisms? More to the point, must we evaluate them? All animals and plants irrevocably shape the evolution of others in ways both large and small. How many of these organisms waste time worrying whether these evolutionary impacts are good or bad? It’s probably safe to say that Homo sapiens are the only ones. In the case of Darwin’s finches on the Galápagos Islands, our authors begin with the premise that the human effect on evolution is a bad one. They investigate the loss of diversity within a particular population of finches. Darwin’s finches are distinctive for their specialized beaks, whether they eat insects or nectar or cacti. Medium ground finches (Geospiza fortis), the focus of this study, eat seeds. 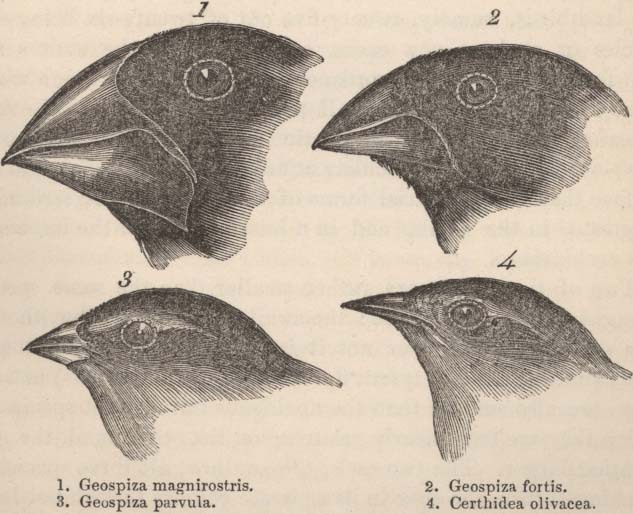 Four of the fourteen species of finches found on the Galápagos, an image from Darwin's On the the Origin of Species, published in 1859. Following this particular species over the decades, researchers have observed that it appears to be diverging into two specialized “morphs,” two groups with different beak forms. Medium ground finches with larger beaks specialize on larger, harder seeds, and those with smaller beaks specialize on smaller, softer seeds. But the population in Academy Bay on Santa Cruz Island looks different. Academy Bay is one of the more populous human communities in the Galápagos and, as a result, human foods have become more and more available to the finches. This wealth of new food has slowed down the evolutionary divergence-in-action, leading to the slow homogenization of beak sizes in the Academy Bay population. As de León and his colleagues put it, human food is “eroding the diet-based disruptive selection that is thought to have previously maintained beak size modality in G. fortis.” Simply put, elsewhere in the Galápagos, the natural food sources of these birds seem to be driving the evolution of these finches into two distinct groups. But the presence of humans and their foods stifles this evolutionary process. Why do we care about “eroding” the “disruptive selection” in the Galápagos—or anywhere, for that matter? One critical reason is that this type of selection maintains diversity. And diversity represents evolutionary potential. In a world that changes all of the time in unpredictable ways, diversity is the source of adaptation to change. Genetic diversity within populations is a natural resource, an evolutionary reserve; if climate change eliminates the food source that most individuals in a population rely upon, a few hardy survivors could still exploit some new and unanticipated food source. But that potential only exists when there is diversity within a population. It’s trite but true: diversity is the raw material of evolutionary adaptation. The authors conclude that the case of the medium ground finch in Academy Bay is another example of “the importance of conserving the processes that generate and maintain biodiversity, rather than just the product of those processes.” The products, of course, are the organisms themselves. This approach to conservation has become increasingly common in recent years. Its proponents argue that we miss the point of conservation when we champion the cause of individual species and ignore the processes of biological change that generate the all-important, more valuable prize of diversity itself. As arguments for conservation go, protecting an evolutionary process probably does not tug the heartstrings of most nature lovers. And as an intellectual argument, it’s important to note that evolution and evolutionary processes do not themselves have any intrinsic value. When we argue for the conservation of an evolutionary process, we must argue for it as an investment in the future, an investment in the generation of biological unpredictability in all of its incipient evolutionary potential. Even Darwin’s finches could find some utility in their entanglement with humans. Without access to human foods, the medium ground finches of Academy Bay may have continued to diverge into two new species, each one specialized on its respective food source, thanks to its respective beak size. The multiplication of species is certainly a form of diversification. The irony, however, is that specialization does not necessarily lead to great adaptability in the future. In this sense, then, losing the close linkage between a specific food source and a specific beak morphology could be a boon for the medium ground finch, a generalizing force that might allow them to exploit a variety of foods in the unpredictable future that they face. Should these last arguments for the utility of human influence make your inner conservationist cringe, consider that humans have always influenced —and been influenced by— the evolutionary trajectories of other species. It’s only recently that scientists have seen this form of evolutionary interaction as suitable for naturalistic investigation. And what more appropriate place to investigate the place of humans in evolutionary processes than in the iconically Darwinian Galápagos Islands?